Statistical information on an XDCR replication can be gathered in real time. The examples on this page show how to monitor a replication; using the UI. 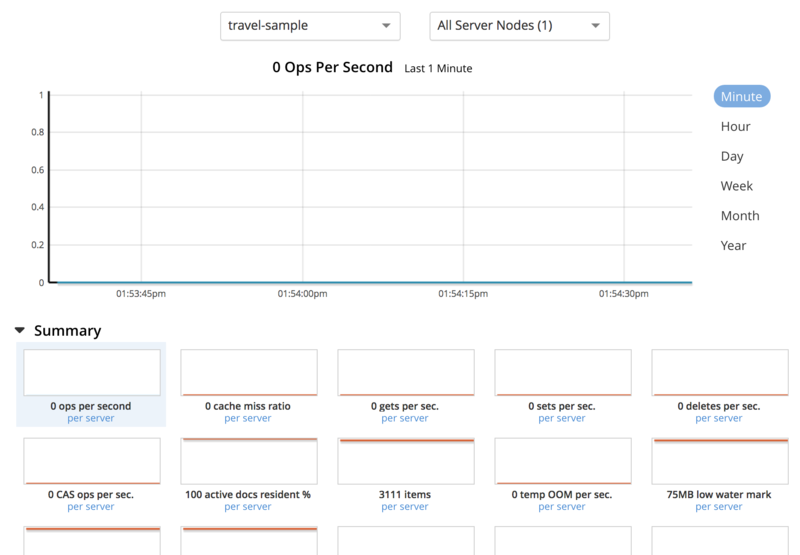 Examples of monitoring XDCR with the REST API are provided in Getting XDCR Stats. No CLI command is available for general XDCR monitoring. As their starting-point, the examples for the UI the scenario that concluded the page Resume a Replication. Information on current XDCR replications is provided by Couchbase Web Console per bucket. 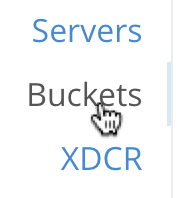 Therefore, to check status, access the Buckets screen (rather than the XDCR screen). Ascertain the name of the XDCR source bucket to be examined. This displays the Buckets screen. A single bucket is displayed, travel-sample which is the source for replication. n mutations: The number of mutations to be replicated to other clusters (measured from the per-replication statistic changes-left). n percent completed: The percentage of checked items out of all checked and to-be-replicated items (measured from the per-replication statistic percent_completeness). n mutations replicated: The number of mutations that have been replicated to other clusters (measured from the per-replication statistic docs_written). n mutations filtered per sec: The number of mutations per second that have been filtered out, and therefore not replicated to other clusters (measured from the per-replication statistic docs_filtered). n mutations skipped by resolution: The number of mutations that failed conflict resolution on the source side, and therefore have not been replicated to other clusters (measured from the per-replication statistic docs_failed_cr_source). n mutation replication rate: The rate of replication, in terms of the number of replicated mutations per second (measured from the per-replication statistic rate_replicated). n B data replication rate: The rate of replication in terms of bytes replicated per second (measured from the per-replication statistic bandwidth_usage). n opt. replication rate: The rate optimistic replications in terms of the number of replicated mutations per second. n docs checks rate: The rate of document checks per second. n ms meta batch latency: The weighted average latency is milliseconds of sending getMeta and waiting for a conflict solution result from the remote cluster (measured from the per-replication statistic wtavg_meta_latency). n ms doc batch latency: The weighted average latency in milliseconds of sending replicated mutations to the remote cluster (measured from the per-replication statistic wtavg_docs_latency). n doc reception rate: The rate of mutations received from DCP in terms of the number of mutations per second. Ascertain the name of the XDCR target bucket to be examined. In the left-hand navigation panel for the remote cluster, left-click on the Buckets tab, and access the statistics for the bucket according to the steps provided above, in Access Statistics for the Source Bucket. n metadata reads per sec. : The number of metadata read operations per second for this bucket as the target for XDCR (measured from the statistic ep_num_ops_get_meta). n sets per second: The number of set operations per second for this buckets as the target for XDCR (measured from the statistic ep_num_ops_set_meta). n deletes per second: The number of delte operations per second for this bucket as the target for XDCR (measured from the statistic ep_num_ops_del_meta). n total ops per sec: Total XDCR operations per second for this bucket (measured from the sum of the statistics ep_num_ops_delmeta, ep_num_ops_get_meta, and ep_num_ops_set_meta). XDCR Conflict Resolution can be monitored by means of the cbstats CLI. See Monitoring XDCR Timestamp-based Conflict Resolution, for details.